The holy and right-believing King Edward the Martyr succeeded his father, St. Edgar the Peaceful (8th July), as King of England, but was murdered after a reign of only a few years. As the murder was attributed to “irreligious” opponents, and Edward himself was considered a good Christian, he was glorified as St. Edward the Martyr by an English Church Council (1001). This glorification was later confirmed by the Council of Bishops of the Russian Orthodox Church Outside of Russia (Decree Nº 255, dated 6/19 September, 1979). He may also be considered a passion-bearer. 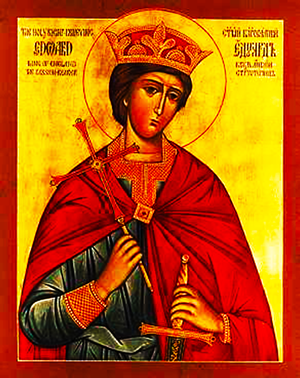 St. Edward ascended to the throne at the age of thirteen. Though the eldest son of King St. Edgar the Peaceful, Edward’s accession to the throne was contested by a group headed by his stepmother, Queen Elfrida, who wished her son, Ethelred the Unready, to become king instead. However, Edward’s claim had more support—including that of St. Dunstan (19th May) — and was confirmed by the Witan. Described by Theodoric Paulus as “a young man of great devotion and excellent conduct; he was wholly Catholic, good and of holy life; moreover, above all things he loved God and the Church; he was generous to the poor, a haven to the good, a champion of the Faith of Christ, a vessel full of every virtuous grace”. St. Edward continued his father’s policies and support for St. Dunstan’s (19th May) reforms. This displeased those nobles who had designs on monastic lands, and they joined with Queen Elfrida in a conspiracy to do away with the young king. On 18th March 978 the king was murdered whilst sitting on his horse outside the home of his younger brother. Almost immediately following his martyrdom, miracles began. Following the murder, the body of the king slipped from the saddle of his horse and was dragged with one foot in the stirrup until the body fell into a stream (which was subsequently found to have healing properties — particularly for the blind) at the base of the hill upon which Corfe Castle stands. Queen Elfrida then ordered the body be hidden in a nearby hut. This hut was occupied by a woman who had been blind from birth, receiving the tenancy from the Queen as an act of charity. During the night, the entire hut was filled with a most wondrous light, and, struck with awe, the woman cried out “Lord, have mercy!” and her sight was restored. The church of St. Edward at Corfe Castle, Dorset today marks the location where the hut is believed to have stood. When the Queen learned of this miracle, she ordered that the body be buried in a marsh near Wareham. However, a year later a pillar of fire was seen over the spot where the body was hidden. The locals raised the body, and, accompanied by a large group of mourners, translated the relics to a church in Wareham where they buried them in the east end of the church. The relics, which when exhumed were found to be still whole and incorrupt, were next translated to Shaftesbury Abbey where they were received by the nuns and buried with full royal honours on the north side of the altar. During the Dissolution of the Monasteries under Henry VIII, St. Edward’s relics were hidden so as to avoid desecration. In 1931, the relics were recovered by Mr. J.E. Wilson-Claridge during an archaeological excavation; their identity was confirmed by Dr. T.E.A. Stowell, an osteologist. These findings were confirmed by the Council of Bishops of the Russian Orthodox Church Outside of Russia (Decree Nº 255, dated 6/19 September, 1979). Mr. Wilson-Claridge donated the relics to the Russian Orthodox Church Outside Russia, which placed them in the care of the monastery of the St. Edward Brotherhood at Brookwood Cemetery, in Woking, Surrey. Truly Thou art wonderful in Thy Saints, O God. "The Church in The British Isles will only begin to grow when She begins to again venerate Her own Saints"